Latitude Financial Services is a provider of credit cards, personal loans, car loans, car insurance, and travel insurance. If you’re considering a credit card from Latitude, check out what’s on offer with our comparison table, based on a monthly spend of $2,000. We discuss these cards in more detail below. We’ve reviewed the Latitude Gem Visa card in more detail here. The GO MasterCard is a no annual fee credit card. We’ve reviewed the Latitude GO MasterCard in more detail here. Interest-free period: Up to 62 days on all purchases. There are also 12-, 18-, and 24-month interest-free payment plans available. A credit card aimed squarely at travellers, the 28 Degrees Platinum card lets you shop worldwide with no fees for international transactions or currency conversions. The card also provides a 24/7 ‘worldwide concierge’ service that gives you access to a host of holiday services. We’ve reviewed the Latitude 28 Degrees Platinum MasterCard in more detail here. Rewards program: 24/7 Worldwide Concierge service which you can call to get help with booking your perfect holiday. The 28 Degrees concierge staff can help you book event tickets, find the right hotel, research destinations and more, and can even book arrangements for you. Latitude no longer offers the CreditLine Card. The CreditLine card is now exclusively offered by Apple, and is available from both their online store and in Apple stores. CreditLine allows you to buy Apple products on lengthy interest-free payment plans. How do I activate my Latitude credit card? The activation process varies slightly for each of Latitude’s credit card products. With the Gem Visa, you can start shopping online with your account number as soon as you’re approved, whereas with the 28 Degrees Platinum card, you’ll need to wait to receive your card and then phone the number on the card to activate it. Can I manage my Latitude credit card online? The accessibility of online banking depends on the Latitude credit card product you’ve chosen. All cards except for the Apple CreditLine card are accessible online through an online service centre, where you can login to check your balance, request changes to your credit limit, and more. How is interest calculated on my Latitude credit card? Interest is charged on purchases when you carry a balance on your Latitude credit card. Interest is charged on cash advances from the date of withdrawal. Latitude calculates interest daily on the remaining unpaid balance of your account. Depending on which card you apply for, a different number of interest-free days will apply to Latitude credit card purchases. Interest-free days will only be available if you have paid the balance in full for the previous month’s statement and for the current month’s statement. For more information about interest-free days, check out our article on how they work. Interest-free payment plans are slightly different. Interest-free payment plans will not be charged interest during the scheduled repayment period. What will my credit limit be on my Latitude credit card? Your initial credit limit is set out in your application based on the information that you provide. You can apply to increase or decrease your credit limit at your own discretion, and Latitude may approve or reject a request based on their lending criteria. Find out more about how credit limits are determined here. How do I close my Latitude credit card account? You can close your Latitude credit card by calling the hotline for the relevant card (see above). Your card balance will need to be repaid in full even after the card is closed. You will continue to receive monthly statements until your card balance is fully repaid. If you are cancelling your card because of financial reasons, then you can contact Latitude’s financial hardship team on 1800 220 718 to find any potential solutions. Latitude Financial Services is a financial institution in Australia and New Zealand that offers credit cards, personal loans and car loans, personal insurance, and interest-free and promotional retail finance. At the time of writing, Latitude advertises they have more than 2.5 million customers across sales finance, credit cards, personal loans, and consumer credit insurance. Latitude is a renamed and rebranded version of GE Consumer Finance Australia and New Zealand, which in late 2015 was acquired by a consortium consisting of Värde Partners, Deutsche Bank, and KKR. Latitude employs over 2,200 staff across the two countries, serving customers through a network of brokers, retail partners and online services. How much do you prefer to pay off your monthly credit card bill? What are you looking for from a credit card? Which rewards types will you redeem the most? Visa vs MasterCard: What's the Difference? Canstar is an information provider and in giving you product information Canstar is not making any suggestion or recommendation about a particular credit card product. If you decide to apply for a credit card, you will deal directly with a financial institution, and not with Canstar. Rates and product information should be confirmed with the relevant financial institution. For more information, read Canstar’s Financial Services and Credit Guide (FSCG), detailed disclosure, important notes and liability disclaimer. Products displayed above that are not “Sponsored” are sorted as referenced in the introductory text and then alphabetically by company. Canstar may receive a fee for referral of leads from these products. See How We Get Paid for further information. The Star Ratings in this table were awarded in October, 2018. The search results do not include all providers and may not compare all features relevant to you. 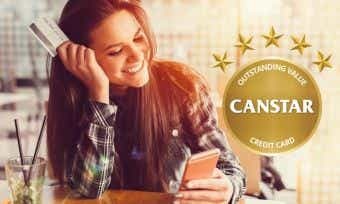 View the Canstar Credit Cards Star Ratings Methodology and Report. The Star Rating shown is only one factor to take into account when considering products.